St. Martin's Griffin, 9781250016218, 144pp. 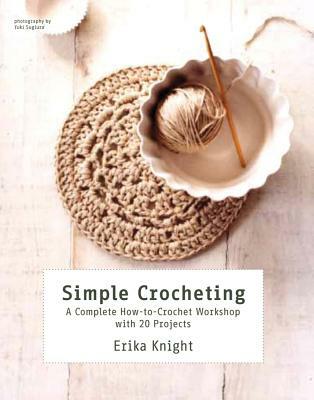 Simple Crocheting is the perfect book for the beginner. Under Erika Knight's guidance even those who have never picked up a crochet hook before will soon be making gorgeous projects and all the while learning new techniques and adding to their skills. Each of the 20 projects in the book will teach you a new stitch, technique, or trick. And with each pattern you complete, you will build on and consolidate crochet techniques already learned in the preceding projects, until you have mastered a wide repertoire of skills and completed and enviable collection of crocheted items. Simple Crocheting showcases the incredible variety of finishes that different crochet techniques can produce. Erika begins with simple scarves and hats that are chic accessories as well as being the perfet items to practice basic stitches. She then takes you through the dense textures of double and treble crochet---which make excellent bags, purses, and even a laptop case---and then moves on to the more intricate, deilcate lace and cluster stitches---perfect for heirloom shawls and antique-style cushions. Freeform or random crochet takes the craft to a more demanding level and projects like the edge-to-edge cardigan will provide a new challenge for all creative crocheters. With exquisite photography by Yuki Sugiura that perfectly shows each of the beautiful designs, and supported with clear diagrams and illustrations, Erika Knight has created the ultimate book for all enthusiasts of this remarkable craft. ERIKA KNIGHT is a highly-respected knitwear and crochet designer, as well as a consultant to the fashion and yarn industries. With her "simple" ethos, Erika has a unique interpretation of craft; her mission is to simplify and communicate her insight and passion for knitting and crochet with accessible yet enticing projects in order to inspire everyone to experiment and, above all, enjoy creating. Erika has recently launched her own capsule collection of high-quality hand-knit yarns, which are all sheared, scoured, and spun in England. As you would expect from this talented designer, the texture and color are truly special. Erika is the author of numerous highly-acclaimed knitting and crochet books, including Simple Knitting and Natural Nursery Knits.